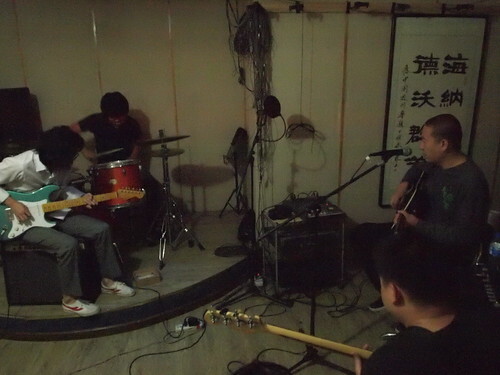 In 2009, the ChinaVine team visited Second Hand Rose in their rehearsal studio beneath a parking garage within Beijing’s Second Ring Road. Part of a small complex of soundproof rooms, the band’s space was set up to allow them to rehearse regularly without having to move equipment in and out each time. Several guitar and bass amps augmented a PA system through which Liang Long amplified his vocal microphone and acoustic-electric guitar. While there was a control room in the space, the band had never used the studio to record their music, instead seeking professional audio recording studios in order to get optimum sound quality. During our visit, in fact, friends of the band were hanging around in the control room working on a computer. The band graciously performed several songs for us during the interview session, and being in the space allowed the ChinaVine team a brief glimpse into the creative process informing the band’s artistry. Present at the interview were Liang Long, Yao Lan (guitar), Li Ziqiang (bass), and Zhang Yang (drums). Unfortunately, long-time member Wu Zekun was not available that day. He plays a range of “traditional” wind instruments with Second Hand Rose, and we were hoping he would be able to discuss his role in the band with the ChinaVine team. Nonetheless, we were able to talk extensively about the band’s use of traditional instruments, sounds, and musical figures, and these elements appear in the Cultural Heritage page. Below you will find a gallery of photos from the studio, as well as a short video clip of the band performing during rehearsal.